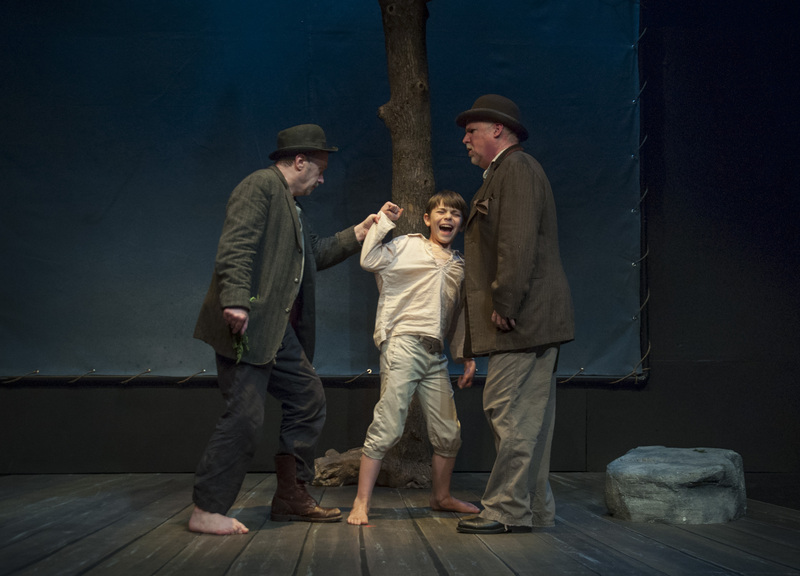 Theatre classes, seminars and scholarly works have tried to define what Estragon and Vladimir are going through in Samuel Beckett’s “Waiting For Godot” for 60 years. Are they in some sort of Purgatory? Hell? Or is is merely a commentary on how our life on earth is wasted in the pursuit or non-pursuit of happiness and fulfillment? Whatever it represents, a solid cast can keep you entertained for two hours while (like Seinfeld) they discuss nothing in particular. Fortunately, St. Louis Actors’ Studio supplies us with that cast, excellent direction and the perfect setting for these five lost souls. Terry Meddows and Gary Wayne Barker lead the way as the befuddled pair Estragon (GoGo) and Vladimir (Didi). We observe them on two- maybe consecutive- days as they are waiting for the mysterious Godot- again, we can only guess who this person is. Is it the obvious (especially the way they pronounce it, God-Oh instead of the more traditional Guh-doe) or is it merely another metaphor for what we may be looking for in our life? But whether discussing sore feet, choosing between a carrot and a turnip or relating what happened to themselves the night before (for they appear to be together only in the daylight), these two actors share pitch-perfect timing. At times reminiscent of an Abbot and Costello routine, they trade banter with ease. They are friends, enemies but always dependent on each other. Even when Estragon suggests they part ways or move on together, Vladimir reminds him that they must wait for the all-important Godot. Two brilliant performances linked by a dependence on each other as close as their characters. Into this bleak setting comes a shabby yet pretentious Pozzo, played with a beautiful blend of haughtiness and bewilderment by Greg Johnston. His tattered clothing has seen better days but he is clearly in command of the gentleman he is leading with a thick rope around his neck, ironically called Lucky. Aaron Orion Baker bows and scrapes to every little whim of Pozzo with scuffling step and a proper deference to his superior. Although he only reacts when commanded to do so by Pozzo, he is silent until Pozzo tells him to think and then goes on a harangue worthy of a Senate filibuster and just about as lucid. Another solid performance that fits right into this bizarre and existential world they all live in. Rounding out the cast is young Hayden Benbenek as a boy who appears only to announce that Mr. Godot will not arrive today, but will surely be here tomorrow. 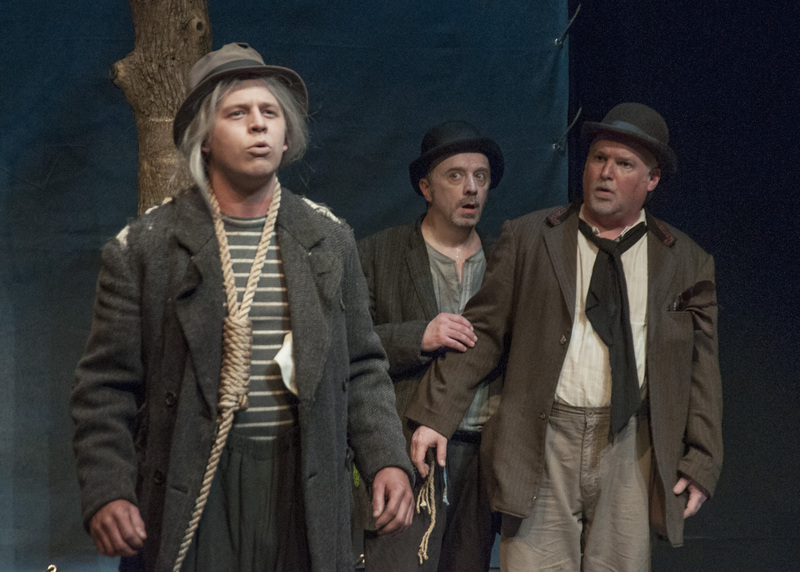 Terry Meddows, Hayden Benbenek and Gary Wayne Barker in “Waiting For Godot” at STLAS. Bobby Miller has directed with a keen eye for the absurdity of the play. He, along with another theatre legend in town, Wayne Solomon, starred in a production 34 years ago at Theatre Project Company (I fortunately saw that one, too). He’s working with an elite cast but has them amping up this script with workmanlike precision. It flows, it moves and has every little touch and nuance that makes it hit home with the audience. And the Patrick Huber set and lighting design is spot on as well. A real, fully grown tree is up center and evidently had to be cut and reassembled on the small STLAS stage. But it’s worth it as it adds to the desolation of the piece as a whole. As I said at the beginning- “Waiting For Godot” can be many different things to many people. Interpretation, like art itself, is in the eye of the beholder. That’s why those classes, seminars and volumes of works on the subject I talked about earlier mean everything and nothing. For that’s what “Godot” is all about- everything and nothing. This is truly a first rate production of a classic example of theatre of the absurd. “Waiting For Godot” is, I’m happy to report, playing to sold-out houses. So give them a call at St. Louis Actors’ Studio, 314-458-2978 or log into http://www.stlas.org for tickets or more information. This entry was posted on April 22, 2013 at 9:43 pm04 and is filed under Uncategorized. You can follow any responses to this entry through the RSS 2.0 feed. You can leave a response, or trackback from your own site.